"Studies show that one of the most important times in a child’s development is in the middle years; between elementary school and high school, this is the time when many kids “opt out” or are no longer interested in taking classes prescribed by their parents or teachers. This is the time when they are most vulnerable to unhealthy choices, and unfortunately those abound. We need to step up the interest level! Create new challenges with new equipment and new professional guest teachers to keep them engaged and challenged. This is part of our bigger goal for the school and for our community: long term growth and development in the physical arts to bring better, overall healthy choices in life!" UMO’s school includes aerial classes using slings, trapezes, ropes, hoops, and acrobatics where tumbling and circus training are just some of the skills taught. With the 2014 Kelly grant, UMO will provide scholarships for low income students, buy new and exciting equipment like a tumble track and padding, and help purchase a new computer to advance their administrative infrastructure. We can’t wait to hear more about it! 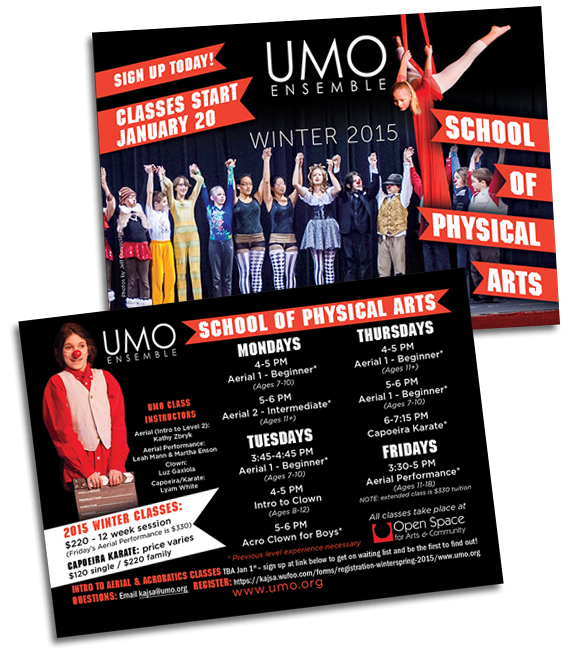 Click here to learn more about UMO Ensemble.